Been out to the cinema lately? Seriously, for what it costs to take the family out to see a move and grab some popcorn these days; you could reinvest the money and it wouldn't take too long before you were installing your very own theatre system at home. Plus, with this spunky Amped Classic 5.1 Surround Sound Speaker wall plate from Amped™, you will really add a professional touch to your media centre installation. Featuring premium engineering, the 5.1 surround sound speaker wall plate is crafted using the finest materials to ensure you get the most out of your home theatre equipment. 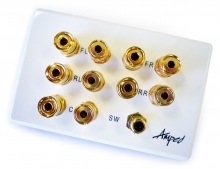 The 24k gold plated contacts ensure pure signal transmission and the premium designed cover plate has been specifically tailored to coordinate with your existing wall plates whilst still providing a custom finish. The Amped Classic 5.1 Surround Sound Speaker Wall Plate is completely compatible with the latest audio standards including Dolby DTS™, Dolby True HD™ and DTD HD Master Audio™, The 5 sets of Binding Post terminals are capable of handling speaker cable up to 10 AWG. Easy installation is guaranteed with this Amped wall plate featuring a unique snap on faceplate and binding post terminals that require absolutely no soldering – simply snap on, plug in and go! To complete your installation, match this item with the Amped Classic Single Speaker (White Wall Plate) to stylishly hide speaker wires within your walls. Designed specifically for Australian houses, the Amped Fusion™ series is the Australian choice for premium high performance cables and connectors. Featuring precision engineering the Amped™ series offers quality equal to Belkin, PureAV, Sony & Monster Cables! The subwoofer output is an RCA connection of which usually a Digital Coaxial/Subwoofer Cable is used for connecting to subwoofers that either feature a left and right input (product code: DCX2301) or a single input (product code: DCX2002)."